Chinese, Thai, Japanese, and increasingly fusion restaurants that offer all these cuisines are commonplace. The long-standing Saigon adds Vietnamese dishes to the Cape’s culinary scene, but for many years (despite a few short-lived establishments) an option has been missing from the Asian spread. My first encounter therefore with Korean food was in Los Angeles at the renowned but strangely named Soot Bull Jeep. Its mirror-glass windows don’t allow you to see in from the street. Perhaps a wise arrangement, for like many Asian restaurants, this is the bare bones of a place as far as decor goes, and the service might be politely described as no frills. The staff are notorious for hardly interacting with non-Koreans, but they responded with surprising alacrity to my toothy smiles. The spot used to be an English pub; a bronze lady with a bustle and man with a top hat on the toilet doors are still testament to its past life. The menu is a single, tatty page, badly printed in a cracked plastic sheath. The place is frankly not particularly clean. It is a bulgogi restaurant, meaning barbecue style. Every table has in its middle a gas-flamed coal grill on which you cook your choice of ingredients. Enormous metal ventilation hoods hang over each table, but it still gets quite smoky when the place is busy and you come out smelling of braai. My host did the honours, ordering thin slices of marinated raw beef, accompanied by a plate of romaine in which you wrap the cooked meat with daikon, raw garlic, and add some hot paste and the national dish, kimchi, spicy pickled cabbage. At about US$20 per person it’s good value. Korean restaurants became popularised in the West only in the early 1990s by such food critics as the New York Times’s Ruth Reichel, when she brought establishments such as Kang Suh to fame in the then outré Garment District. Korean bulgogi hasn’t taken off here. South Africans like things done for them; as one Pieter-Dirk Uys character famously said when contemplating the revolution: ‘I rather die in my bed, than have to make it myself’. Cook their own food? Think of all the fondue places that have failed here. I hope the cute little Nakasaeng Korean Happy Kitchen will buck the trend. It seems to be popular with some of the young Sea Point set, Korean locals and tourists. 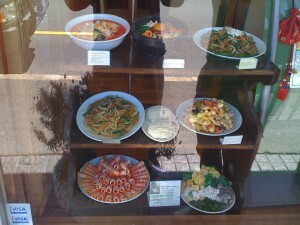 On display in the window is a rack of painted, wooden replicas of plates of food. The husband (who sports a dandy bowtie) and wife owners are warm and welcoming. There is a conventional seating area and then a raised, knotty-pine platform with low tables for sitting on the floor. The tables are set with a traditional long handled soupspoon and a pair of steel chopsticks. The background music ranges from Celine Dion to The Beetles to Tchaikovsky’s Nutcracker suite. The menu (with photos), introduces the cuisine with “happy food is the starting point of a healthy life” and continues, “the human body is a microcosm, and it is ruled by the five elements of energy: wood, fire, earth, metal and water; any good cuisine will have all these in balance. Welcome to tasty Korean life”. Although the bilingual menu (Korean and English) is ostensibly divided up into appetizers and main dishes, in practice rice and soup with side dishes (banchan) and main dishes are all served and eaten simultaneously Korean style. You could order a starter of steamed dumplings (pork, beef, prawn or vegetable) or gimbap, which is a Korean version of the Californian roll with rice, seaweed and various fillings. The equivalent to my LA meal is R78 here and it’s cooked for you. Don’t order water with your meal; Korean cuisine is very liquid. It consists of a vast range of different styles of soups, broths and watery stews, to which are added either vegetable, beef, pork, chicken or seafood. There are noodle soups with various ingredients and jijigae, a stewy soup with rice. This is a good place for vegetarians with many styles of tofu soups. I tried the boiled whole baby chicken in a hot pot with glutinous rice, ginseng and Korean plums that would have pleased a Yiddisha mama. Perhaps the best option for a small group of diners is to enjoy the communion created by the Chef’s special menu for shabu shabu. Originally Japanese, the Koreans have made this dish their own, and spiced it up. A boiling pot of flavoured soup is placed on the table in which you cook the ingredients such as thin strips of meat (R128 for 2 persons) or seafood (R158) then dip them in a soya and ground daikon sauce. A noodle or thick rice soup is served at the end. Finally, you might finish off your lunch or dinner with a gratifying cup of Chrysanthemum tea. Naksaeng, 77 Regent Road, Sea Point. Tel: 021 439 3373. 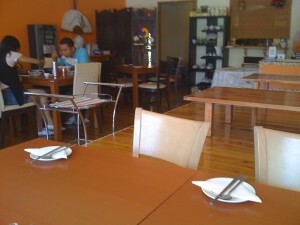 Dae Jang Kum Korean Restaurant, Early Dawn Mall, Rivonia Boulevard and 9th Avenue. Tel: 011 234-7292.